Horseback Riding on the Beach in Florida! Maybe this is old news to you, but I didn’t know you could go horseback riding on the beach in Florida, particularly in the panhandle. 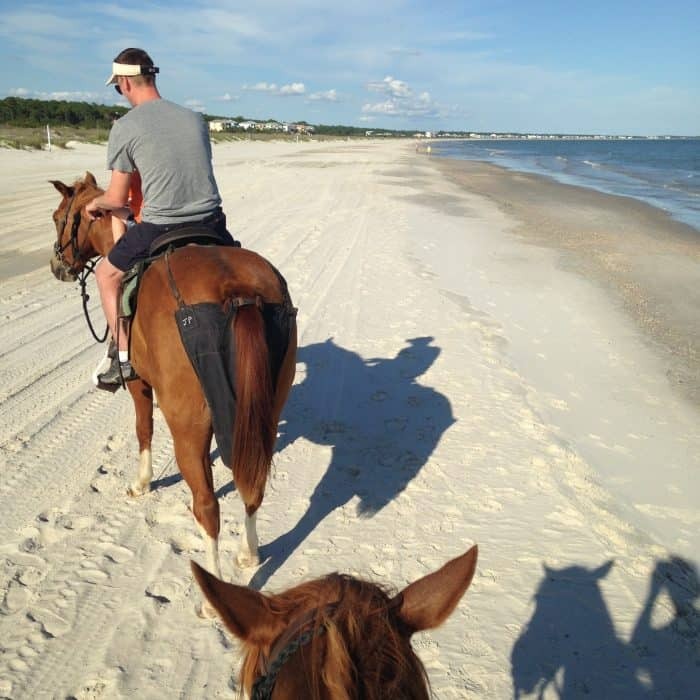 I thought for those of us in the Southeast that beach horseback riding was something limited to a cruise line shore excursion in Mexico (or maybe the Keys) or something you get to do at an all-inclusive resort. 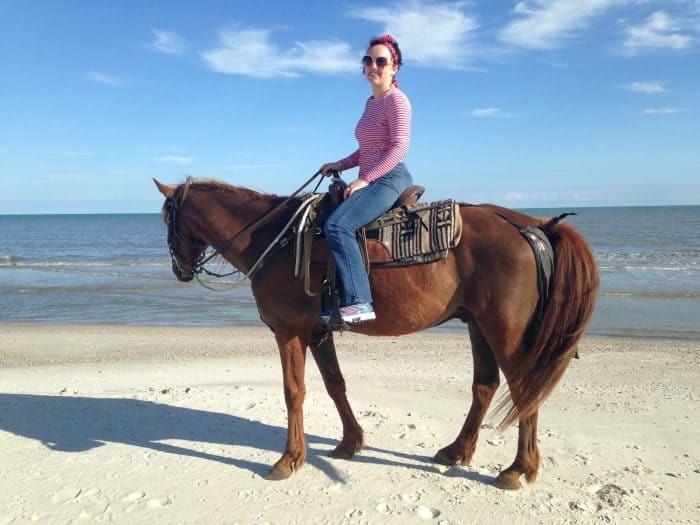 Imagine my delight when I got to cross horseback riding on the beach off my bucket list, and I didn’t have to go further than the Gulf Coast! 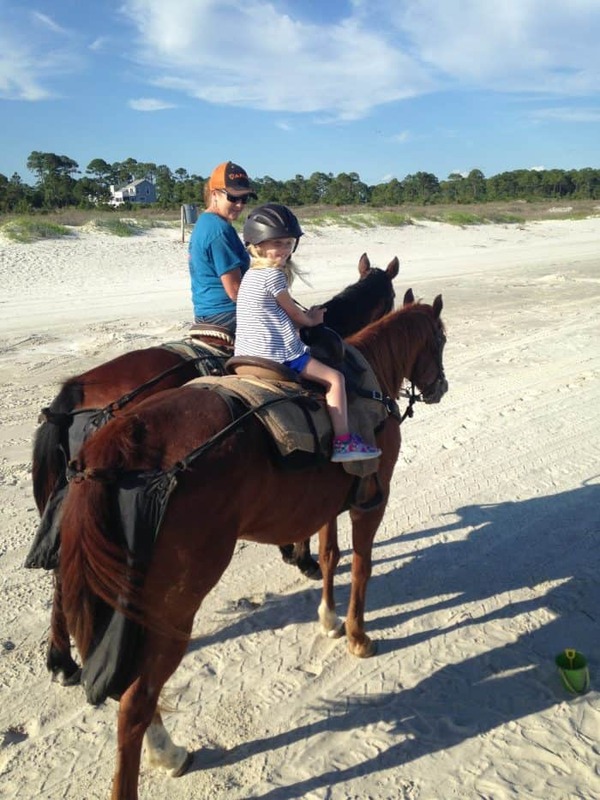 Horseback riding on the beach is one more reason Cape San Blas has a home on my list of great beach vacation spots. Our Sunset Reflections by Natural Retreats rental included complimentary beach rides with Rockin’ M Ranch. 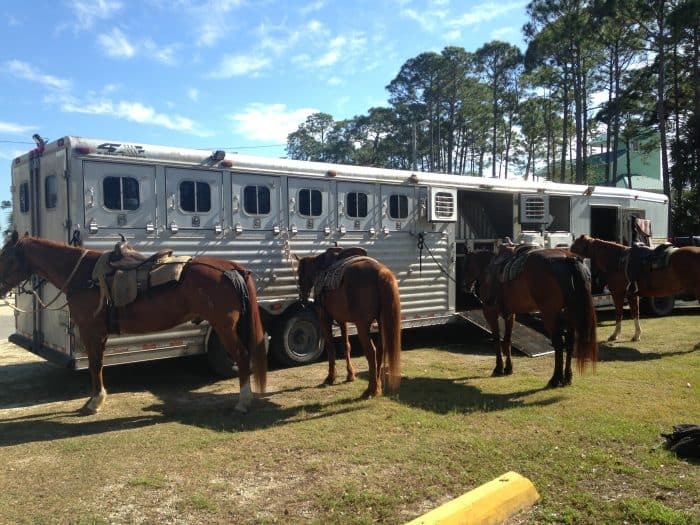 Their horses are trailered from the ranch to Salinas Park and you’ll ride from there down the wide, wide beach. Perfect for groups! As a former teacher, Julie is as great with kids as she is the horses. Sweet T is generally slow to warm up to people, but she took to Julie right away. Some of the horses at Rockin’ M Ranch are rescues and you’ll get to hear their stories from Julie. Striker is a petite guy which made him perfect for my vertically-challenged self. He was quite skittish when he came to Rockin’ M, likely due to an abusive owner. Julie’s TLC has worked wonders on him. Dunkin’ (named for the donut shape on his forehead) was the big guy in our group, and he gave Hubs and Gus a gentle ride. Don’t you love the poop bags? They are necessary and solve a *ahem* big problem, but they still crack me up. 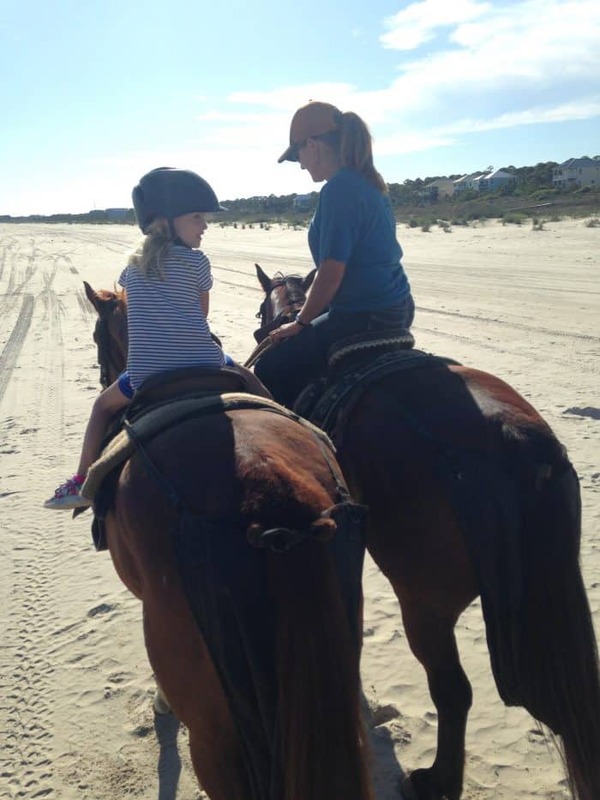 Julie knows each of her horses so well that she accommodates their preferences during beach rides. 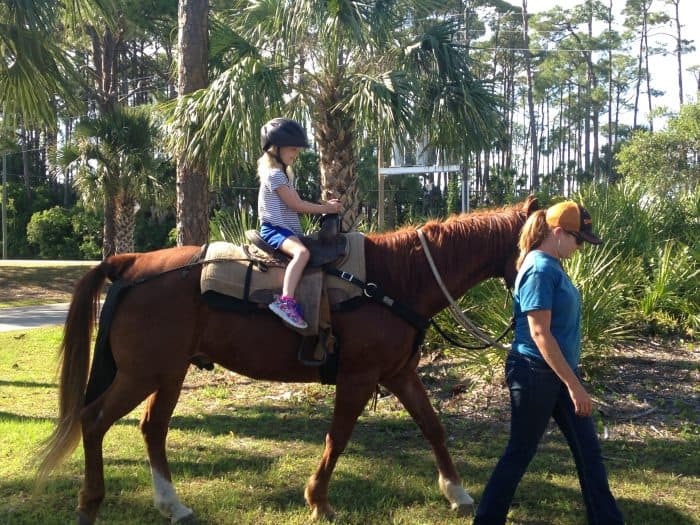 If a horse has a buddy he feels more confident with, Julie makes sure they go out on a ride together. Some horses like to lead and others like to follow. One might prefer to ride closer to the shore while another wants to gravitate a little further from the water. Hearing stories about the horses and getting to know them a little bit was just as much fun for me as the ride itself. Julie’s love for them really shines through. 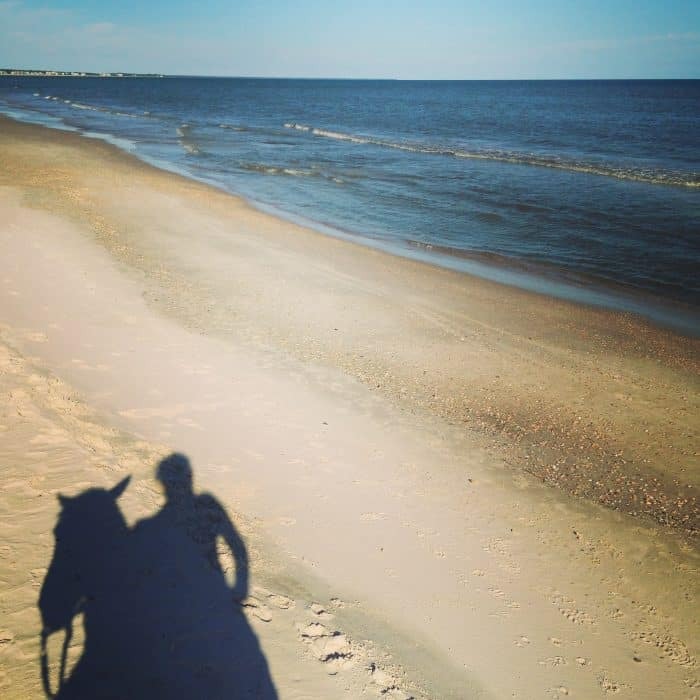 Trotting on the Cape San Blas beach is prohibited so prepare for a slow, relaxing ride that allows you to take in the beauty around you. Don’t forget to bring your phone or camera! Julie will stop at the halfway point and take some fun group shots. No double riding is the official policy. – Gus is a little afraid of horses and won’t ride solo, so we were fully prepared for Hubs to stay behind with him while Sweet T and I rode. Julie made an exception since Hubs and Gus’ combined weight is only about 180lbs (do not tell either of them I was talking about their weight. Shhh..) and they are both small enough in build that they both fit comfortably and safely in the saddle. Please do not go into this experience hoping for an exception to me made for you. 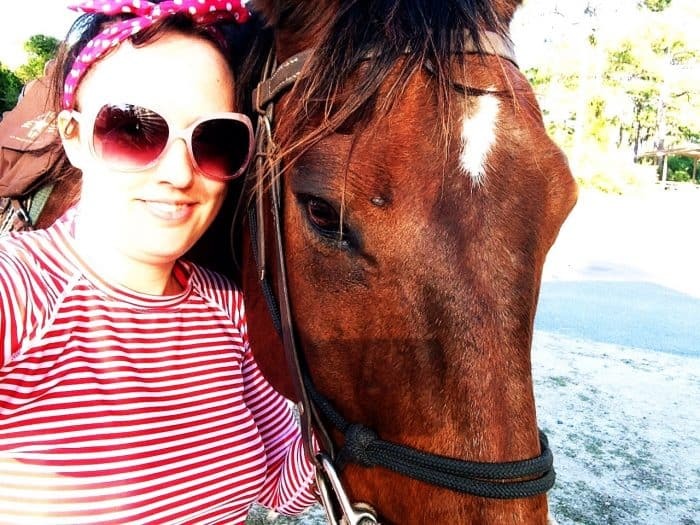 Julie’s top priority is your safety and the well-being of her horses. The weight limit for riding is 240 lbs. – No exceptions here. Remember those ethical concerns I mentioned earlier? Did you know that horses should only carry up to a certain percentage of their own body weight on their backs? Julie has done the math and is going to keep these gentle giants comfortable and healthy. Let’s appreciate that! Now that I’ve experienced horseback riding on the beach in Florida, future beach trips might feel a little incomplete without it. 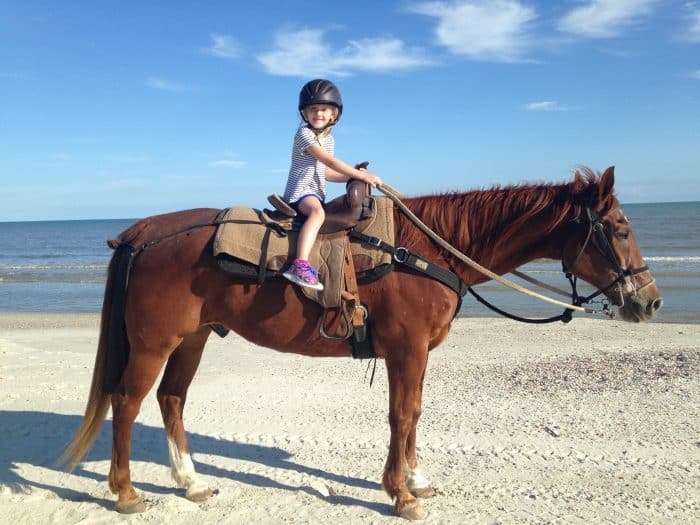 Ready to go horseback riding on the beach in Florida with your family? Visiting Cape San Blas is a great way to do it. 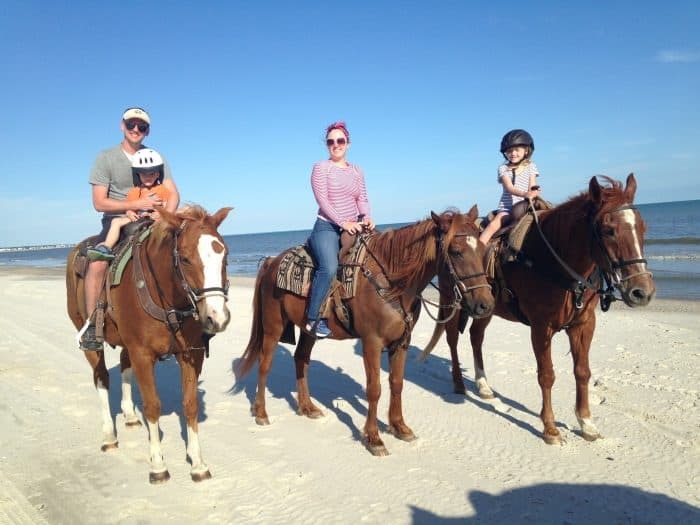 You can contact Rockin’ M Ranch directly or book a stay with Sunset Reflections by Natural Retreats and enjoy horseback riding on Florida beaches as part of your vacation package. Our experience was a complimentary due to our partnership with Sunset Reflections by Natural Retreats. All opinions are my own.